The 3 Faces of Mobile | Also Creative Inc.
You know that your company needs a mobile solution because of the growth of consumers and employees using tablets and smartphones, but is a mobile website enough? Or do your mobile goals require something more? There are multiple options for mobile solutions, but it may seem impossible to decide which is right for your business, especially when you have NO idea where to begin. That’s where a mobile development company comes into play. Not a company that makes a generic product to sell to hundreds of companies, but one that takes the time to get to know your business and your business’ needs. Meeting with a development company can be overwhelming if you don’t have a basic understanding of your options. To get you started we have outlined the three basic mobile options. A native app is a mobile application that is designed to suit different operating systems such as Android or Apple’s iOS. Because native apps are designed to work with individual operating systems they are able to access different areas of the user’s phone such as the camera or contacts. Mobile Apps are designed to be used with or without an internet connection, this way your app will be available to users wherever they are. If you intend to use high quality graphics, and features look no further than a native app. However, because of the time and knowledge that must go into building a quality native app, they may not be affordable for smaller businesses. If you have a smaller budget, but still know the importance of having a mobile connection with your customers or employees, a responsive web app may be the right fit for you. 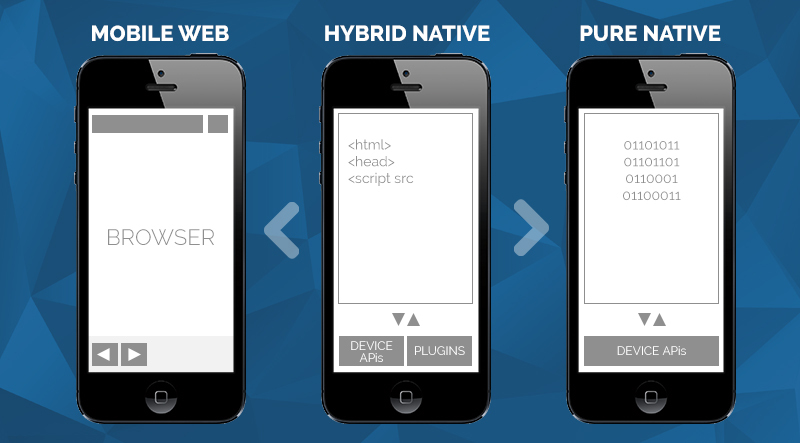 Web apps are a way for small businesses to develop affordable mobile solutions. Web apps work across all platforms and do not need to be developed individually, therefore they are much faster and less costly to develop. Web apps still provide customers and employees with a mobile connection to your business, although they are only available to users with an online connection. As we all know this has becoming increasingly important with the growing popularity of mCommerce. Web apps do not require downloading to be used, therefore they don’t take up storage on the user’s mobile phone or tablet. Web apps also provide URLs that allow for easy sharing, which is an advantage as a small retail business. If you are a business with a smaller budget, but still want to create a mobile friendly experience for your customers or employees a web app may be the best option for you. If you are a large organization and you desire a high quality mobile experience, a native mobile app will better suite your needs. If you are somewhere between the two, a hybrid app might be be perfect for you. The best way to decide on which type of app would best suit your needs (and not to mention your budget) is to set up a free consultation. We love learning about your businesses and coming up with fun, creative, and effective mobile solutions. If you or your company is interested in learning about how your business can make use of mobile technology, contact us and we'll be glad to setup a consult.